The searchers will look for a huge 12-cylinder engine that several hunters reportedly have seen in the woods over the years. It is believed to be half-buried under 60 years of undergrowth and fallen leaves. The helicopter-mounted infrared, it is hoped, will be able to sense the heat that the engine absorbs from the sun. “The forward-looking infrared will look down through the trees, looking for the heat difference between the engine of the airplane and the surrounding terrain,” Gillespie said. The search relies heavily on the stories of Anson Berry, the pickerel fisherman, and a deer hunter who happened to sit down to eat his lunch a few years ago just a few yards from a large rock. The hunter, who had serviced aircraft engines while in the military service, suddenly realized that the rock was a large engine, probably from an airplane. Another hunter also reported seeing an engine in the woods, some years earlier than the other hunter. “We had been waiting a long time for someone to hold up their fingers like that,” Gillespie said. Finding the site would be only the beginning. Gillespie said the next step will be a complete archeological evaluation of the site, with archeologists locating a number of specific items from the plane. They will watch carefully for a number of gold platinum and silver parts from the body of Nungesser, who survived several major air crashes before the White Bird flight. 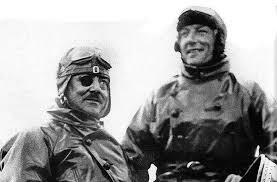 Although the two flyers didn’t know it, the plane also carried a French aviation society medal that would have been presented to them in New York as a prize for completing the flight. “After everything is recovered, the remains of the airplane and crew will be flown by French aircraft to New York to symbolically complete the flight,” Gillespie said. Gillespie said French officials are talking about transporting the remains to France aboard a special Concorde airliner. 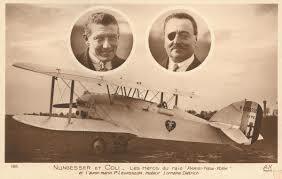 The remains would be flown to Le Bourget Airport near Paris, where the White Bird flight originated, in time for the Paris Air Show, which will be held at Le Bourget this summer.